This past weekend, Mary, Paul, Joy, David, Jarrah and I drove to Big Bear in the Big Blue Bus. We stayed in a cabin, courtesy of a family at Mary and Paul's school, and since Big Bear is only a three-hour drive into the San Bernardino forest, we were able to vacay on the cheap. David and I spent our last weekend as a child-free couple in Big Bear, 18 months ago. We stayed in a child-free B&B in a huge room with a hot tub, two plushy recliners, a DVD library, and homemade baked goods and cocoa every evening. It was cold outside, and we barely left the room. At night, the only sounds were the crackling of our faux-fireplace and the wind in the pines. Readers, I know Big Bear, and Big Bear is a friend of mine. This was not the Big Bear I know. Sharing a cabin with two 2-year-olds brings a--what word shall I choose?--stimulating dimension to the Big Bear experience. Yeah, stimulating. That's it. As in, none of us slept very much, and Paul (bless his heart) helmed the Big Blue Bus through hazardous conditions of toddler no-nap screams. In an optimistic mood, we purchased a six-pick of Mike's Hard Lemonade (yummy) at the local Von's to accompany the movie-watching and board-game-playing we had planned for the peaceful hours of toddler snooze. That six-pack is still in the fridge. We arrived pretty late on Friday afternoon, and it was even later by the time we'd squeezed a few minutes of nap out of the girls. But I had the trusty Big Bear File (my internet research) which indicated that the Alpine Slide was open until 9:00. After a passable BBQ dinner, we made it to the slide at 8:30. A big yellow moon was on the rise as this wonder came into view. The Alpine Slide is 1/4 mile of snaking fiberglass luge track, accessed by a ski lift chair, and traveled by lightweight bobsled. The rider controls the speed with a big red stick between the legs. Lean forward, and the sled speeds up. Pull back, and it slows to a near-stop on a hair trigger. Quite a sophisticated ride for a piece of plastic. Strangely, children over two are allowed to ride for free on the front of an adult rider's sled, and neither Jarrah nor Joy expressed any apprehension when the subject was broached. First, we swung precipitously into the cool air as the chairs took off, rising high between silhouettes of tall pines. Each chair can hold two riders, so the girls each rode with one parent. When it was me, I tingled with anxiety, knowing that my hand was the only thing between a fun ride and our bodies smashed on the rocks below. She was oblivious, though, and loved it, calling out to the chair in front of her that she was going to "catch" them. At the top, we settled ourselves into the sleds, nestling the girls in front. I went by myself the first time, and couldn't stop laughing; it was such a rush. The sled was sleek, light and slippery, and zipped through the luge as if on water, banking slightly around tight turns. When I felt brave, I pressed the stick, and I zipped even faster. The sensation was one of childlike pleasure, with nothing to think about but the wind in my hair and the sound of my own screams. All too soon, we were bumping into the finish line, but the nice guys running the operation let us have another ride before they shut down for the night. I said several times that $4.00 seemed way too cheap for so much fun, and added that the full moon and having the whole place to ourselves at night pushed it into the sublime. We knew we'd be back, and in fact managed to pull off the same arrangement the following evening. By then, Jarrah was yelling "Again, again!" when we were only half-way down. An annual event we happened to be in town for, this festival in the north shore community of Fawnskin is going strong in its sixth year. We thought the girls would enjoy it after their enthusiastic response to the San Diego Fair. This was a decidely smaller event. We paid a dollar to wear an American flag pin that itched, and entered a dusty parking lot where some vendors were hawking their wares. There were crocheted hats for $15 (you could even have one crocheted while you waited,) two adorable greyhounds, a lady overseeing some cuties from the Wildlife Rescue (including the world's smallest white owl with ginormous eyes, inspiring David to announce, "That is really the cutest little birdie ev-ah.") There was a make-your-own Shave Ice (yum!) and an apple-pie contest (not sure who or what was competing, but David loved the pie.) Later, a bunch of men came through on horses, and then a lady sang an ear-splitting version of "The Star-Spangled Banner," followed by a man reading a poem by a lawyer from Maryland--something about every country being America, which made me cringe a little, standing as I was between an Australian and two gals from China. Afterwards, we were hungry, and the only option in the whole town that didn't have a "B" for their health inspection rating (eek!) was a divey-looking place called The North Shore Cafe. I was skeptical as soon as I saw the oilcloth table covers and dingy carpet, but everyone was sitting down so I kept my mouth shut. Well, color us surprised, Readers. Everything was scrumptious. Paul actually said it was the best omelette of his life. I did notice the menu said "Chef Owned," which seems like a good thing. As it happened, we had a surprise return visit to the NS Cafe, since it was the next day (!) when we finally noticed that our strollers were missing. We had left them in Fawnskin and never missed them. Operation Stroller Retrieval gave us an excuse to find out if our yummy meal had been a fluke. Apparently, it hadn't--it was even better the second time. If you find yourself in Fawnskin, be sure to stop by. The name of a Muzak-inspired cover band, currently in residence at the Boo Bear Den, a family restaurant in downtown Big Bear Lake. After an unsuccessful expedition to see The Simpsons (well, what were we thinking? That the girls would enjoy it because of Maggie?) we walked a couple of blocks to this family institution, home of the All-You-Can-Eat-Salad-Bar-of-the-'70s, featuring julienned beets, cottage cheese, cling peaches, yellow cheese, three-bean salad and iceberg lettuce, and pulled up an outdoor table in the sultry evening. The staff was friendly, the courtyard sparsely peopled, and the girls had the opportunity to run amok while "Fantasy" played "My Girl" and "Celebration." I kicked back with an extremely strong Mai Tai and resolutely ignored the strange-smelling, Sysco-looking food that took an hour to arrive. Why, you ask? Because it was summer, I had a nice little buzz going, and because to Jarrah and Joy, "Fantasy" might as well have been Justin Timberlake for all the exuberant hand-waving and Elaine Benes-kicking the girls enjoyed with their bad selves. As the sun set, "Fantasy's" tweety-voiced lead singer came around to our table and took the names of the J girls, all the better to insert them in a naughty version of "Margaritaville." When you hear your child's name invoked as the cause of some drifter's incipient alcoholism and it makes you clap and go "yay!" --that's entertainment. I was determined to get on a boat ride during the weekend, because I've been going to Big Bear since childhood and have never actually been on the lake. The first choice was called the Big Bear Queen, but crafty Paul spotted a flyer for the Paddlewheel Tour Boat on the bulletin board at the Boo Bear Den, and alerted us to its charms. I know we made the right decision, because we saw the Queen from our lofty perch on the Paddlewheel, and it appeared puny indeed. We kept putting it off because we just couldn't get places on time, but finally, Sunday afternoon following Operation Stroller Retrieval, all the planets aligned and we found ourselves at Pine Knot Marina a full half-hour before departure. And kids ride free! The Paddewheel is spankin' new, and we were early enough to snag a pristine table in the center of the upstairs deck, nicely sheltered by a big canopy but open to the breeze. From our table, we had a great view of the shore as well as the control room. Both girls had been crying and carrying on up until the moment we pushed off from shore, but in seconds flat, they were captivated by the churning water. We spent a blissful 90 minutes cruising around Big Bear Lake on a gorgeous, sunny afternoon, admiring the homes of the rich and famous on the lakefront. The most interesting was The Rock House, where the owners were challenged by giant boulders on the property that could not be removed by law (I'm not sure why not) so they built the house right around them. Looking in the window, you could see a huge rock in their living room. I glimpsed a guy reading a magazine on the veranda, and I wondered if he knew how many boats went by in an average day that were talking about him. I won't lie to you; there were some moments during the weekend that got pretty grim. One or more children screaming for prolonged periods and two spotty nights of sleep tend to undermine one's joie de vivre. But there was at least one episode of pure hilarity that kept us going, and it occurred on the trip out, when everyone was still fresh and bubbly. Mary had thoughtfully purchased new "car prizes" for the young ones, and after an hour or so, it seemed like a good time to bring them out. The prizes were miniature princess Barbies, complete with brushes, combs, some sort of boudoir furniture, and their own pet cats. The girls spent at least 3 minutes in total concentration, torturing the dolls with the combs, resulting in a new hybrid: Dredlock Barbie. So far, so good. At one point, Mary turned around and asked, "Are you having fun with your princesses, girls?" There was no response, the tonsorial ministrations having absorbed them completely for the moment. Mary persisted: "Do your princesses have names?" Joy looked up as if rather suddenly enlightened. "Sconecan," she said, and resumed combing. There was a short silence. "Well, I'm glad you're having fun with Princess Sconecan," Mary replied, at which point I nearly blew my own head off laughing for about half an hour. You probably had to be there, but we found ourselves returning to the scene of the Sconecan all weekend. Jarrah: I want pimple, too. Sam: Oh, trust me. You don't. After the crazy week of the 48 Hour Film Project (see the link to David's blog, if you speak geek, for why something two days long took a week) and the excitement of making the Best of San Diego screening, I was looking forward to a thrilling weekend of doing nothing whatsoever. Alas, it was not to be. Or rather, it was, but I could not enjoy it. Saturday morning I sent David out to water the plants, and he returned in short order holding his camera. "We have a problem," he said, and showed me the screen. In it was an ordinary shot of our garden hose, or what would have been an ordinary shot if it didn't have a stripey skunk asleep in the middle of it. "Yikes!" I said. That was my useful contribution. Before long, the skunk had waddled over to sleep near our trash cans. As the sun moved higher, the skunk moved to a shady spot--under my car. At this point, something seemed fishy (it did not yet seem skunky) because, aren't skunks nocturnal? "Maybe he's dehydrated," I hypothesized. "Maybe he's a tame skunk who has chosen us to be his family," I added dreamily. In the interest of fostering good relations, I put a paper plate of melon under the car--the internet said they like melon. Hours later, the melon was untouched, and the skunk wasn't moving. David decided to squirt him just a little with the hose as an incentive to move on. He squirted, and the skunk just sat there, forlornly getting wet. "That skunk is not well," David said mournfully. He was quite upset. I've often felt that David has a special bond with animals and should probably have his own show on Animal Planet. Animal Control is closed on the weekends. Project Wildlife said they don't deal with skunks. We weren't sure what to do. The afternoon crept on. Jarrah was a little too interested in the skunk. "He doesn't feel well, " I told her. In late afternoon, we finall smelled it. Skunkiness. Thick, strong, everywhere. It filled the whole house. It didn't even occur to me then what it must smell like in my car. Under the car, the skunk appeared to be dancing. David said he was having seizures. That didn't sound good. We went out and didn't come back until 10:30. The skunk was there, now sleeping next to a rose bush. I woke up in the middle of the night and Googled "skunk removal." There were a bunch of services you could pay to remove skunks. That was reassuring, though I wondered how much it was going to cost. In the morning, David told me that he'd called one of the services. The man had said, "That skunk has distemper and is going to die. It's not our problem anymore." "Whose problem is it?" I wailed. The stink was still everywhere, and I was afraid to go outside because we might get distemper, whatever that is. "Let's call Jessica," I suggested suddenly. "She knows everything." Jessica said to call 911. She said it was an emergency because the skunk presented a danger to ourselves and our neighbors. That certainly seemed true. I called them. The lady on the phone cut me off--not unkindly--after a few words. "This isn't a police emergency," she said. "Have you tried 24 Hour Emergency Animal Control?" Is that a magic place, on the other side of a secret force field? I wanted to ask. Because this is the first we've heard of it. But instead I copied down the number. There was a satisfying "your call is being recorded" beeping sound while I explained our situation. "We'll send someone as soon as we can," she said. "Keep an eye on him." Finally, about 11:30, two ladies in official uniforms came, and David joined them outside. I saw them peering at the skunk but didn't dare look beyond that. David came back in after about five minutes and said they had agreed about distemper, said our skunk was suffering and wasn't going to make it, and had euthanized him with an injection before taking him away. "Where skunk gone?" Jarrah wanted to know. "The ladies took him to the hospital," I said. I opened my car door. The smell was uncanny. We vacuumed everything and sprayed every surface with Nature's Miracle. I went to the car wash, and the car came out sparkling. I opened the door afterwards, and if anything, the smell was worse. I went to the drug store, because throughout this escapade, I'd been gritting my teeth from the flood of histamines in my limbs caused by my allergy to mosquito bites--bites I sustained over a week ago during the film project. As I exited the store, the smell of skunk assailed my sinuses. I looked up, and my mouth dropped open in amazement. I was smelling my own car from across the parking lot. I sprayed a lot of Fresh Linen Febreze in there and went to do another errand. When I opened the door again, a cloud of Fresh Linen Skunk smacked me senseless. By the time I got home, the smell was lodged deep in my frontal lobe. I resigned myself to either a) selling the car or b) slowly losing all my friends because I'll be known as That Girl Who Always Smells Like Skunk. We went to dinner and sat outside, where trucks revved their engines inches from our food, and a man at the next table sucked on a big cigar. "Bring it on, baby," I said to David. "If it's not skunk, you could shove it right up my nose right now and I'd love it." The only thing that cheered me up last night was going to see Hairspray, which is chockoblock with groovy singing and dancing from the first frame, not to mention the fabu hairstyles and dresses. 'Course the main character, Tracy Turnblad, rocks a 'do with skunk stripes, but I tried not to think about that. This weekend was the 48 Hour Film Project, our fourth year of entering the contest. In the citywide race, each competing team has exactly 48 hours from drawing their genre out of a hat to submit a short film of 3-7 minutes. All writing, shooting and editing must be completed within the 48 hours, and all participants must be volunteers. Other than that, all bets are off. This year, in a reprise of Year One, we drew Fantasy as our genre. For required elements, our prop was a spoon, our character was Alex Gomm, County Employee, and our line of dialogue was "Keep that thing away from me!" If you are local, please come see our film (and nine others in our screening group) on Wednesday, July 18 at 7:30 p.m. at the Landmark Hillcrest Cinemas. 6:30 p.m. After Nia, I make my way to the Starbucks upstairs to await the news from the kick-off. I am shortly joined by Jessica, who is participating for the first time, but is an old hand at film production. I'm anxious. Once the clock starts ticking, it's a freefall to the finish line, whatever happens. 7:05 p.m. David calls on my cell. We got Fantasy again. I am a bit bummed but still grateful not to have Western or Horror. They are on their way to Walter's for the planning meeting, and we'll meet them there. 7:30 p.m. We pull up at Walter's and are joined by Paul and Mary. This is their first year participating, too, and I'm excited for them to see what it's like, even though I know Friday night can be a bit haggard-making. 7:35 p.m. Mingling and pizza-ordering at Walter's as the team arrives. We found Walter on Craigslist the first year we competed--he's a great actor, but also loves writing and directing. We've been friends ever since. It's nice to be back at his house. The team gathers in a circle of chairs outside and I'm amazed how big it is this year. 8:00 p.m. We get into discussing ideas. We start in a kind of orderly progression around the circle, but it falls apart pretty quickly with a lot of cross-talk, shouting and tangents. Not that there's anything wrong with that--it's part of the process. In this time frame, "script-writing by committee" is only going to happen by sifting through a sieve of chaos. Most of our ideas need fleshing out, but Jessica's magic Fortune Cookies sound promising. So does Adam's Renaissance man with amnesia. Jake is excited about Fantasy and wants to go full-throttle in the direction of Lord of the Rings-style storylines. I am resistant because I saw one of those movies, and it's three hours of my life I can't get back. He starts getting a little adamant. I start getting a little shrill and dismissive. It degenerates from there. Suffice to say we end up apologizing to each other later, and that Tara got some juicy footage for her "making of" documentary, in which we will begin to see certain trends about my collaboration style. 10:00 p.m. Lots of mosquito bites, I'm falling asleep, and we still don't have a story. Jesus the sound guy announces that he is going home, and that he has faith that the writers will produce an amazing script. Gulp. We start discussing casting and call-times for the next day. Somehow it ends up that I am going to act this time. I've acted before, but I didn't last year. I am not the ingenue, of course. I never am. The ingenue is always someone who is 21. This year's candidate is Eva, from Bulgaria, and she is a sweetheart. No offense to ingenues, but it rankles that I never get to be the ingenue just because I am old. 11:00 p.m. We are sort of going with Adam's Renaissance knight and sort of Lord of the Rings. But...there's no story. We have an eager new writer, Ashton, who asks if we are going to stay up and write the whole script. He is really sweet, but I announce that I am going to bed and will write as we shoot in the morning. This concept seems horrifying to several people, but it's what we've done before, and I have no intention of getting exhausted this early in the game. "I have a two-year-old," I tell anyone who will listen. "I need my rest." I also repeat often that everyone is to contribute to the "Chow Kitty" this year, which is an actual jar that I've labeled "Chow Kitty," because "I have a two-year-old, and she eats a lot and goes to school." 2:00 a.m. David and I are lying in the dark. We are not sleeping. We are whining about our anemic story. "I don't want Renaissance man to speak in Middle English! It's too much!" I yell into my husband's two-inches-away ear. "Also, why is our main character always a man? What's up with that?" 7:00 a.m. I pack a bag with a black top and skirt, because I'm supposed to look like a boss but also a witch. I then get Jarrah ready for her playdate with Nicole, so I don't eat any breakfast. We send them off to the Aquarium--she'll drop Jarrah at the set later. We stop at Einstein's to pick up stuff for the team and I get an egg sandwich, thinking I'll need the protein. 9:00 a.m. We were supposed to meet on set at 8:00, but...oops. The location is a trailer office at a construction site at UCSD, because Walter works there and has keys to most of the school. I am amazed to see Jessica already there, and she quickly sets up our first real Craft Services on a long table--this year, we have coolers full of water, juice and soda, and terrifying amounts of chips, chocolate and Red Vines. Olivia is also there, and she soon becomes the set mascot. 9:30 a.m. Walter offers to show me and others the "forest" that he's scouted for some of our scenes. He has the keys to two golf carts, and we get to whiz through the center of campus. I am elated at this precarious ride, marveling that I spent 12 years at UCSD and have never before seen it from this perspective. Before we know it, we're off-roading into the trees behind Warren College. In a clearing of white eucalyptus, there is a mysterious "nest" of twigs, big enough for Walter to climb inside. He demonstrates how he is going to leap out of this twig pile on film. 10:30 a.m. Back at the trailer, it's time to get serious about the script. Ashton and Tim have an outline, which is a fair sight more than I thought we had. Ashton and I huddle with his lap top, fleshing out the dialogue. I am plagued by the knowledge that we still have no clue how to end the thing. 11:00 a.m. Still in the middle of dialogue, I'm called to dress, hair and makeup for an upcoming office scene. Jessica fixes my hair and pretties me up; she does the same for Eva, who is also in this scene. While Jake, David, Kevin and Jesus fiddle with the camera and sound, I dash back and forth between the interior office, where Ashton and I are writing dialogue, and the shot location, where I'm coaching Eva how to deliver the "brilliant" lines I've written for her. I go back and forth for an hour or so, and finally tell Ashton to finish what he can and I'll catch up with him later. I spend a lot of time turning on my heel and storming out of the room, but it's for the scene, not because I'm difficult. 12:00 p.m. Mike, aka "Boom Mike," has returned from picking up our free lunch at Three Squares, all the way down in Del Cerro. I almost cry when I see the incredible spread of neatly labeled sandwiches, the huge salad, and the veritable crate of just-baked cookies that Clyde has donated to our project. We take a little break to fuel up. 12:30 p.m. Nicole and Jarrah return from the Aquarium. Mary and Joy have been playing with Yea-Yea outside the trailer. Mary takes Jarrah and Joy back to their place for a nap. Yea-Yea is sad to see them go, but she has made a lot of other new friends on the set. 1:00 p.m. We keep shooting office scenes in the trailer. It's getting really steamy in there because we have to turn off the AC, since it interferes with the sound. Ashton is still holed up in the interior office, typing away. Now he has Jessica and Paul helping him. I dash in and brainstorm when I'm not "encouraging" the actors. The afternoon slides by. We still don't have a completed script, but they're shooting what they can. Some time around 3:30, the four of us figure out the ending. 2:00 p.m. Kanda arrives. She has just driven to Julian and back, per instructions from her brother Jake, to pick up several boxes of Lord of the Rings costumes. Because she's awesome, she's also stopped at Party City to procure some fake armor and a witchy broom. 3:00 p.m. I walk across the street to the bathroom for the first time all day. As I do, I am almost run down by the two golf carts careening down the lane. One contains Tim, holding a laptop. The other contains several grinning guys and a camera mount. 4:00 p.m. We print a script and Ashton writes "FINAL" on it in red pen. This marks the first year that we've had an official script, one that is actually in Final Draft, with numbered shots and lots of "INT" and "EXT." 4:30 p.m. A bunch of us drape ourselves in the costumes. Tim looks quite knightly, and Eva is downright ethereal in white lace and a huge mane courtesy of Jessica's curling iron. 5:00 p.m. It's finally time to leave for the forest. The whole team goes, and much of our food is outside, so Walter closes the gate. People pile into the golf carts and the rest of us take whichever cars are nearby. 5:30 p.m. The marine layer rolls in, and we are losing the light more quickly than anticipated. As some of the boys start filming Tim, now dressed as a knight, running through the trees, I start barking orders for a "second unit" to shoot Eva, now dressed as a princess, shackled to a tree. The second unit consists of me, Paul and David, who is almost pitching over from the weight of all the equipment he's juggling. We spend a good 15 minutes just experimenting with different ways to shackle Eva, with chains that are made of styrofoam. 6:00 p.m. I found a witch costume in Kanda's box, and have worn it to the woods. I make David shoot me making witchy jazz hands behind a tree because I think it will look funny, and who knows? Maybe we'll need something like that. 6:30 p.m. I'm getting frantic. We need several more forest shots and no one seems to know what's going on. I discern this because a lot of people keep yelling, "I have no idea what I'm supposed to be doing!" This is probably because the script has only been finished for a couple hours, and because only Ashton, Jessica, Paul and myself have seen it. I rev into frenzy. Walter is confused by my direction when we get to the pile of sticks. He keeps insisting he has dialogue in this scene. I am holding the script, and I assure him he does not. He keeps saying, "Don't you even remember what we talked about this morning?" I am sweaty and my head is pounding. I take a few seconds to search my memory, then suddenly freak out. "I may remember it. I may not remember it. That's not important right now. What's important is we are losing the light, the scene needs to be shot, and I don't want to argue about it. So go stand in your nest right now!!!" He does, but he's mad. I am beyond caring about anything, because that's what it gets like on the Saturday when it starts to get dark. We shoot the scene, Walter and I hug and apologize to each other. I really love that guy. 7:00 p.m. About 20 Asian people have gathered to watch us, and are snapping photos. I approach them, smiling, and whisper "Where are you from?" "Los Angeles," a man whispers back. Tim is standing in the golf cart as it races along, pretending to be galloping a horse. It's hilarious. 8:00 p.m. We finish the outdoor shoot, and head back to the trailer, pumped. Adam and Kanda have brought us dinner from Lightning Jack's BBQ, another one of our sponsors. Adam is sweet even though he's wearing a different outfit because the first one got a sauce bath. The hot food is comforting, and we're feeling pretty good about the forest footage. 9:00 p.m. We start shooting a couple remaining scenes in the trailer. Eva and I get back into our office garb. Jessica patiently redoes our hair and makeup. It takes forever to shoot two seconds of footage in which Eva opens her laptop and makes a relieved face, because the lighting has to be just so. Interspersed, the natives are getting restless. Jesus leads several members of cast and crew in an impromptu dance that involves slapping one's own behind and shouting "Slap that thing!" Jessica says, "Now we're starting to get silly." 11:00 p.m. We move all the gear across the road to the Visual Arts building, where Walter has the keys to an IT guy's office that has so much junk in it, there's barely room for a camera. We're trying to find something that Walter as Earl can be eating with a spoon when Tim knocks on the door. The IT guy has a couple yogurt containers, so we grab those, only to discover they are filled with mold. Walter pretends to eat from one anyway. 12:00 a.m. We're done shooting. Only because some sound mixer has just exploded, so we couldn't get any more takes if we wanted them. Jesus gives the camera the finger when Jake says "It's a wrap!" We spend a half-hour cleaning our junk out of the trailer and stowing the food and gear in various trunks. I am dopey with exhaustion as David drives me home. He tells me he liked my acting, and that Jake thinks I should be the director this year. That is flattering to hear because Jake was the director last year. 2:0o a.m. David and I finally wind down enough to fall asleep, having just eaten a huge salad left over from the BBQ, perhaps to compensate for an entire day's diet of chocolate and soda. 8:00 a.m. David is whispering that he's leaving, and I tell him I'll bring more food and water when I follow. I want to go back to sleep (Jarrah stayed with Mary and Paul) but now that I'm up my head hurts so bad that even turning over is agony. I get up and zombie-walk to the kettle. 9:00 a.m. I call David to check in and he says all the IT Wizard footage is missing, so he's racing back to UCSD to meet Tim and Walter and re-shoot. Not one of us, until Paul hears about it hours later, thinks to suggest filming in David's office (where everyone is going to edit anyway) since there will no continuity loss. Oh, well. 11:00 a.m. I meet Paul, Mary, Joy and Jarrah at Flower Hill Mall in Del Mar, where they're watching a Hullabaloo concert at a toy store called Thinker Things. The Kid Kraziness level is elevated, and while I feel guilty that my child hasn't seen me in two days and that Paul and Mary are wrangling two toddlers, my mind is definitively elsewhere. I don't stay long. 12:00 p.m. I arrive at CineForm with water and more food. It's pretty subdued in there; Jessica and Jake are hunched over his computer, and Adam is composing next door. A few minutes later, David comes in with Tim, followed shortly by Tara and Kevin. I am wary of what I say around Tara at this point, since she gets it all on film. 1:00 p.m. I organize the liability release forms and write the credits on a yellow pad. By the time I see them on Tim's screen two hours later, they look completely different. For one thing, I've been listed as director. That feels very weird, since what I've mostly done is make sandwiches and act bossy. 3:00 p.m. David is fuming. There is a synch problem with most of the early scenes, apparently caused by a "firmware failure" in the borrowed camera equipment. I don't know what that is, but it doesn't sound good. He calls a team meeting, tells everyone that there's no way we'll make the finish line on time, and perhaps we should plan to stay until midnight (the final deadline for screening) and just do a really good job. Jake says he doesn't want to decide something like that until 5:00 or 6:00, and I agree with him. I order David to go back to work and quit his kvetching. I can do that because I am married to him. 3:30 p.m. I call Mary from the hallway, and learn that both girls are asleep. Thank goodness. I tell her that David thinks we won't finish on time. "Do you really think that's true?" she asks. "Well," I say, inspecting my purple toenails. "He does say that every year." 4:00 p.m. I sit at the desk nearest the door and knit my "Ribbed For Her Pleasure" scarf. Periodically, I stick my head in people's doors and ask if they need a snack or some help. Everyone says no. I feel kind of helpless. I always feel helpless on the Sunday afternoon, because I don't know how to edit. Revise that: I am good at editing, but I don't know how to use computers. 4:15 p.m. I hear Jake shouting and go running towards his office. Something about Tim has his costumes with him, so let's get him outside and just reshoot. "What's going on?" I moan. I run back to where David is, and he tells me that every bit of footage shot after 7:00 p.m. is missing. "Meaning most of the forest scenes?" I ask, icy dread gripping my heart. "Right," he says, but as he says it, I realize it sounds wrong. For one thing, there hasn't been a year when someone hasn't announced that crucial footage is lost, and it always turns up. For another, I was there when David was transferring it the night before, and I remember seeing it. I start yelling and waving my arms that everyone just has to calm down and find the damn thing, and sure enough, someone remembers that a "fire wire" or somesuch had a second file or whoseit and that it's probably on another drive or whatnot. And that is what comes to pass. Wouldn't it be rad if I could wrap this up by saying that my cool head saved the day? 4:30 p.m. Adam lets me (actually, he very kindly asks me) to listen to the music he's composed for a couple of scenes. It is so awesome I get really, really excited. It jazzes up the pace of all the footage that's been edited so far, and creates a whole new layer of humor, too. I decide he is a genius and I tell him so. He's very modest about it. Emboldened, I sit down in Jake's office and start offering unsolicited advice about transitions, which is what I usually do. Jake never loses his cool, though, and somewhat bizaarely seems to know what I mean before I've even finished speaking, so the fixes happen fast. 5:00 p.m. Suddenly, a wave of optimism sweeps through the office. Everyone is running around; my heart is pounding. Jessica tells me they have a complete rough cut except for the opening scene, and it's been exported to Adam for scoring. Tim is completing the credits. The paperwork is done. If they can whip out that opening scene and get the thing rendered, we might just make it. 5:30 p.m. Opening scene not synching. Will. Not. Synch. More running and yelling. David and Jake start rendering on separate computers. It's going to take a full hour to render! AAAAHHH! Can we cut the time in half with two computers? CAN WE? Well, maybe if they both didn't keep crashing every two seconds. 6:30 p.m. More crashing. Less synching. Missing scene. Music not complete. Confusion over what will go over the credits. Tara choosing doc photos for a "picture in picture" outtakes session. Meanwhile, I'm insisting that the credits should consist entirely of me, dressed as a witch, snarling "Raaaar!" into the camera. Hey, they don't talk about directors' "Vanity Projects" for nothing. 7:00 p.m. I am mad. Not sure at who. I think I'm mad at the computers. The damn things do crash so. Always at the worst time. I've seen most of the film and it looks very funny, very tight. Every time I think about not being eligible for prizes after all this insanity I want to punch a wall. Instead, I thank everyone through gritted teeth and leave to go pick up my child. I was going to have to do that no matter whether we made it on time or not. 7:30 p.m. It's official. We didn't make it. I thank Paul and Mary and get Jarrah in the car for the long drive home. I am exhausted--that always happens--but also numb, and that is new. The usual feeling is a kind of light-headed elation, the thrill of both winning a race and creating a piece of art all wrapped up in one 48 hour package. I tell Mary how sad and angry I feel and she says something smart: "Well, you still finished a movie in a weekend, and you'll always be able to say that." Very true. It's not like we'd go through everything we did without the contest. And we still get to see it on the big screen. And we're eligible for the Audience Award. So come on down and vote! So, I tried a hard thing today, at least hard for me. I took a class with Jessica at Two Sisters and Ewe to learn how to knit socks. I guess I got cocky. After my triumphant scarf experience back in February followed by a slightly less triumphant but ultimately successful hat experience in March, I figured I was ready for socks. How hard could it be? I mean, there are two of them, granted, but they don't look that complicated. You just need a cyclinder and a place for your toes, right? Maybe a place for your heels? Piece o' cake. Jessica is already a pro at everything except maybe socks. Which is probably why she didn't start freaking out when I did, which was when I sat down at the table. In front of me (courtesy of Jessica's generosity and cornucopian stash) was a skein of "sock yarn," very pretty multi-colored stuff about the width of fishing twine. Okay. Next to it was a plastic packet of bamboo skewers, the kind I use for making Chicken Satay on the grill. 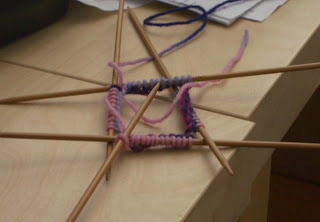 Only it turns out they were actually knitting needles, and that I was going to be knitting with all five of them. At the same time. Our teacher, Nadia, was adorable. She was sort of Goth and wore a knitted headscarf around her dyed-black hair that she probably made herself. "Let's start by casting on 48 stitches," she began. "Use a long-tail cast-on." A what now? Turns out my "cheap and dirty" finger wrap cast-on has been expedient but will not be the sum total of my cast-on education. She "demonstrated" how to pinch the yarn like a harp string between thumb and index finger, fling my hand open like a jazz dancer, and then swoop the whole thing downwards like a bird. Only then was I to begin jabbing one of the sticks hither and yon, in the hope that it would result in stitches on my needle. I began to sweat and shake. That is par for the course when I learn something new. Nadia seemed a bit agog at my rudimentary skills, but she was polite. By some miracle, I figured it out, and managed to cast on my 48 stitches. Then she showed me how to "slip" the stitches onto the other sticks, 12 each until I had four, and then bind the whole thing together like a God's Eye from camp, sans Popsicle sticks. At this point, I was feeling pretty cool. I had learned a new cast-on, and had accomplished some complicated stick architecture with the slipped stitches. In my mind, the socks were practically done. Then Nadia asked me to "knit one, purl one" in the round for 18 rows. "Ummm...." I said. "Knit one, purl one in the same row?" I could tell that Nadia was having difficulty even comprehending my lack of experience. I have only knit and purled in alternating rows. To alternate stitches, I'd actually have to know what a knit and purl looked like, and I'd have to "prepare the yarn" after each stitch so it would sit in the right place. That last bit was where she lost me. She said something about wrapping towards the top and bottom, which I never understood. I spoke of wrapping right and left, which she never understood. Then we settled on "do everything counter-clockwise," and I had a moment when I thought I was getting it. But every time I showed it to Nadia, she said, "You're twisting your stitches." Readers, I don't know what twisted stitches look like, so I didn't know how I was making them. Stitch after stitch, I knit when I should have purled, and purled when I should have knit. I wrapped top when it was bottom, and bottom when it was top. I kept jabbing the needle through the almost molecular loops and reminding myself that using all those needles is a bit like driving in the snow: just don't look directly at it. Suddenly, I glanced up, head spinning, eyes glazed. I got up from my chair and wandered over to the other side of the store, where I tried to relax by touching the beautiful soft skeins of yarn hanging everywhere. Didn't work. Each one seemed to be taunting me, "You can't make socks out of us! You can't make socks out of us!" I hate to admit defeat, even if something is hard. I have a childhood history of quitting hobbies that I'm still trying to shake. But I wasn't having any fun, and my eyes were really killing me. Nadia broke it to me gently: "If I'd known you hadn't done much knitting, I would have suggested that socks were a bit ambitious." A nice lady next to me touched my arm and said, "I donated my sock yarn. Let me show you this shawl I made instead." Meanwhile, a girl across the table who appeared to be six years old was whipping out the fanciest socks I've ever seen. Maybe she's been knitting since birth, I told myself. After all, babies have to do a lot of sitting around. And Readers, why do they call it "knitting in the round?" That sucker was a square if I ever saw one. Jarrah is taking swimming lessons right now at the YMCA. It's a two-week immersion program (hee hee) with parent participation. The Rupperts are in our class, too, by design, and a handy design it is, since they have been very helpful both in the water and out. So far we've had a different teacher each time, and the second one, Miss Kaitlin, was better. Miss Nicki was perfectly sweet, but Miss Kaitlin was a bit more hands-on with the suggestions. And by the second lesson we were needing more suggestions because, well, Jarrah is not a natural fish. The skills we've been learning include arm stroking, kicking, back-floating, ducking under and climbing out of the pool. I'm not being sarcastic about the last one--turns out that a big part of child water safety involves being able to get oneself out of the water once one has gone in. Most of these skills are accompanied by little songs, and sometimes the kids get a ball to throw and then swim towards it. Jarrah doesn't like to throw her ball, and when she does, she prefers that I convey her to the ball through my own efforts rather than hers. And that's about where we are skill-wise, Dear Readers. Jarrah is very fond of the water, and I am fond of being in it with her, as she snuggles in my arms and hugs me for a half-hour that she otherwise wouldn't, since she's not a hugger. She hasn't cried or seemed scared, but she has some definite ideas about what she will and will not do in a pool. For starters, she doesn't want her face wet. She does not want to blow bubbles. She doesn't want to kick. She doesn't want to lay on her back. When gently coerced into prone positions where she begins to feel unsafe, her voice gets high and shrill and she repeats "No, thank you! No, thank you!" until I bring her back to hugging position. Strangely, though, she seems completely relaxed, smiling and laughing, until prodded out of her comfort zone. I guess that sounds like most of us. There's a song that accompanies the dunking exercise that concludes the lesson, and it goes "Tick-tock! Tick-tock! I'm a little cuckoo clock! Tick-tock! Tick-tock! Now I'm ticking one o'clock!" Apparently, kids can be persuaded to dunk better if they get used to having their ears wet, so the teachers have encouraged us to wag the children from side to side during the "tick-tock" part, toss them in the air at "o'clock," and finish with a mutual dunking. We don't get that far, though, because Jarrah starts yelling, "No tick-tock! No tick-tock!" and clings to my torso like a barnacle. And you know what, Readers? I find that I don't much want to dunk, either. I've done it a few times, to be a sport, but it seems awfully wet and chemical-y. How was I ever on the swim team? Because, we've been told, going underneath is part of swimming. Who knew? In any case, Jarrah is not in a rush to master basic water safety. I'm trying to be okay with that. I hear that being okay with things is a big part of parenting. Wish me luck. Jarrah has been enjoying movies lately. We went to see Shrek the Third earlier this summer, and today we joined the Rupperts for Ratatouille, which was clever and even incorporated some fun "foodie" references. One movie that's made a big impression on her in recent months is Finding Nemo (though she calls him "Meemo.") For anyone who hasn't seen this colorful classic, it's about a little clownfish who gets captured off the Great Barrier Reef and ends up in an aquarium inside a dentist's office in Sydney. His father, Marlin, sets out to rescue him, at various times aided and hindered by a forgetful but adorable blue fish named Dory. The film, in the manner of responsible kiddie movies, has a number of messages to impart, including "Love will find a way" and "Friendship can be found in unexpected places." A more subtle theme explores what we forfeit and what we gain by facing our fears. And it's on the subject of the latter that Finding Nemo has the greatest impact on Jarrah. Nemo gets into trouble, indeed, the entire plot is driven, by a single instance of flagrant disobedience on his part. Not that Marlin, his doting but overprotective father, isn't also to blame. It's his overzealous warnings that provoke Nemo, embarrassed in front of his new school friends, to do the thing that Marlin commands him not to do: Nemo touches the boat. A simple act, but one with swift consequences. Nemo places his little fin against what looks like a fishing boat, and seconds later, a masked diver appears out of nowhere to scoop him up in a net. "Never to be seen again" might apply, except that the diver drops his mask and Dory is able to read his address on it. The scene is full of anticipation and dread. Marlin shouts to his son with increasing desperation, reminding Nemo of his limitations, and Nemo--stubborn, contrary--continues to swim past "the drop-off," defiantly heading for open water where he is an easy target for any predator. Nemo doesn't say anything during this stand-off, but the look on his face is familiar to anyone with a two-year-old. The look says: Make me. Go on, make me. So much of my days with Jarrah is spent warning her about the perils of the world. Don't open the front door--someone might take you away. Don't wander off in the parking lot--a car might smoosh you. Don't stand on that chair--you might fall off and crack your head open. Don't eat any more raisins--you'll get a tummy ache. I warn and warn and warn and then I threaten and I warn some more. Does she listen? It depends. Sometimes she complies with nary a fuss; other times she seems not to hear me. Sometimes she looks right at me and does what she wants to do anyway, just like a certain orange fish. "Don't touch the boat" is the one moment from Finding Nemo that Jarrah quotes exactly, and she quotes it often. "Don't touch the boat," she tells us, and then she adds something important. "Listen to Daddy." Then she'll reinforce it a few times: "Listen to Daddy; I no touching the boat." It seems to me that the central message of toddlerhood is "Don't touch the boat." Don't touch the boat, my child. You have no idea what could happen, but I do, so listen to me. It's for your own good. Someday you'll understand. In some primal way, this has got to be comforting to a two-year-old. If you just listen to Daddy, everything will be fine. The rest of the crap won't even happen. I can see wanting to believe this. But the rest of the crap has to happen, or there's no movie--and there's no life. Someday she's going to touch that boat--who knows why?--maybe we won't even be there to tell her not to. And then she'll have to rescue herself. Notice that the movie isn't called Rescuing Nemo. Ultimately, Nemo comes up with his own plan to get out of the aquarium and back to the ocean. Sometimes it scares me how little I can truly protect Jarrah. Telling her not to touch the boat may not be enough, or (as in Marlin's case) it might be too much. We just have to hope she knows that we'll always try to find her.